This model was originally equipped with a single pickguard and two control knobs. Both dot or triangle inlays on the fingerboard. The model 381 was abandoned by the factory in the early sixties. Reintroduced with different features in the late sixties.It now had a double pickguard two additional knobs and a fifth mixer control. 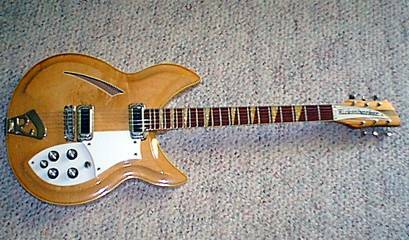 This guitar was the first Rickenbacker to have the new Hi-Gain pickups. These first appeared on a model 381 made in February 1969 and later became standard on production models. At first, the factory called the new Hi-Gain units the "381 type coils". The model 381 was dropped from production in 1974. Reintroduced a second time in 1987 as a Vintage Reissue model 381V69.